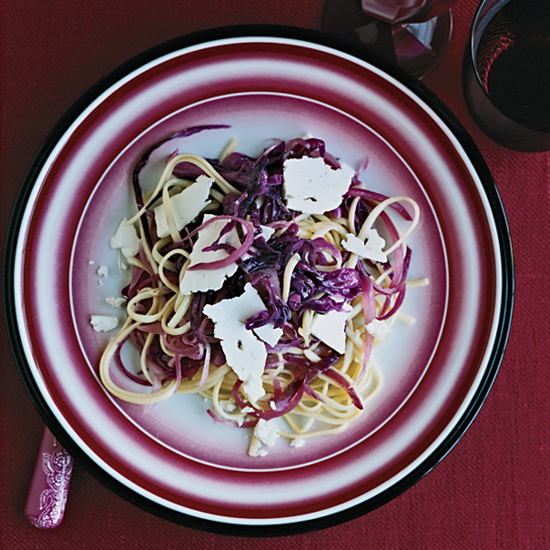 A comprehensive guide to pasta recipes, including a summery fettuccine alfredo and a baked four-cheese spaghetti. 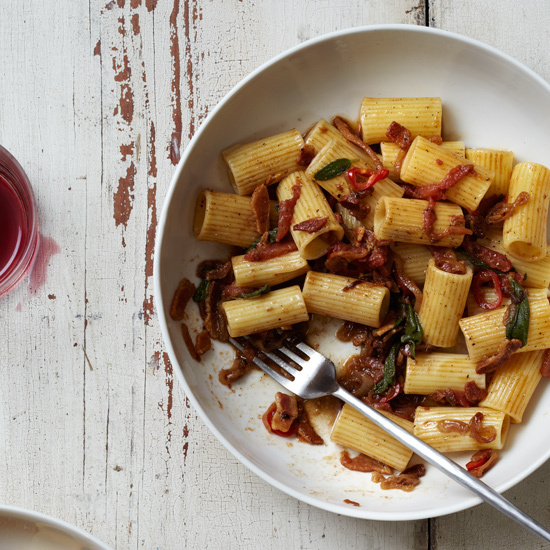 Chef Hugh Acheson's amatriciana sauce strikes the perfect balance of porky (from the pancetta) and spicy. 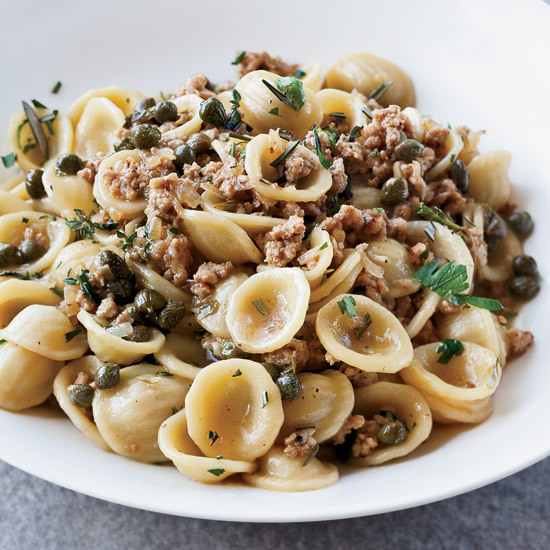 Grace Parisi's fried capers add a delectable, salty crunch to pasta tossed with fresh tomatoes and prosciutto. 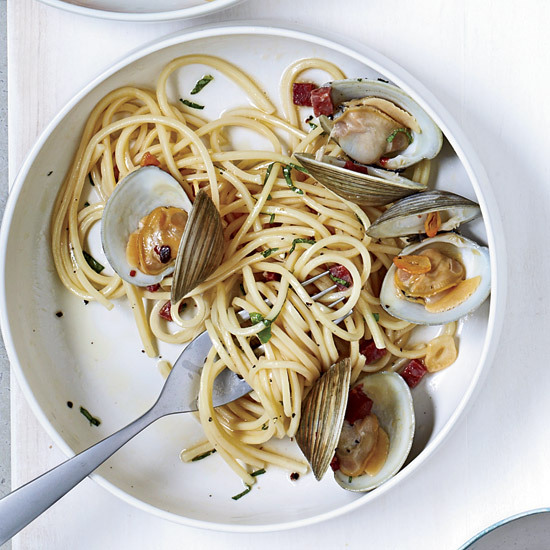 Pair with a crisp Verdicchio. 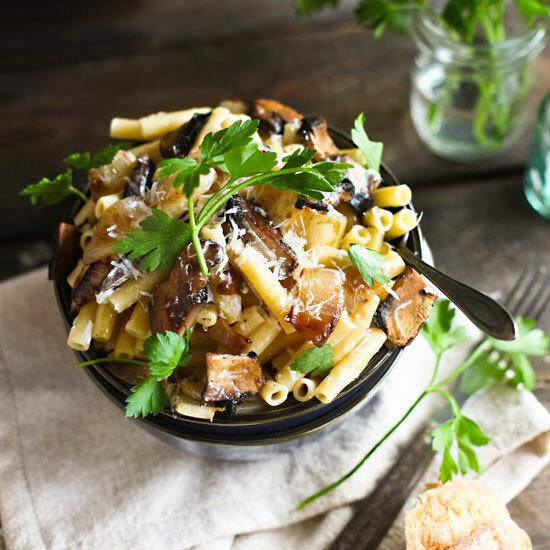 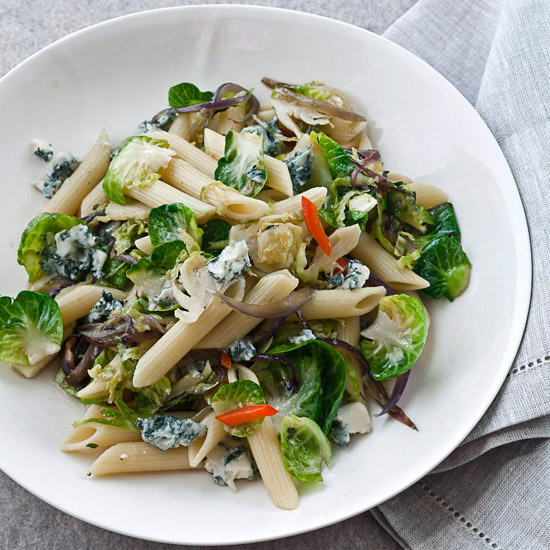 This extremely flexible recipe can be adapted to include several different kinds of seasonal vegetables. 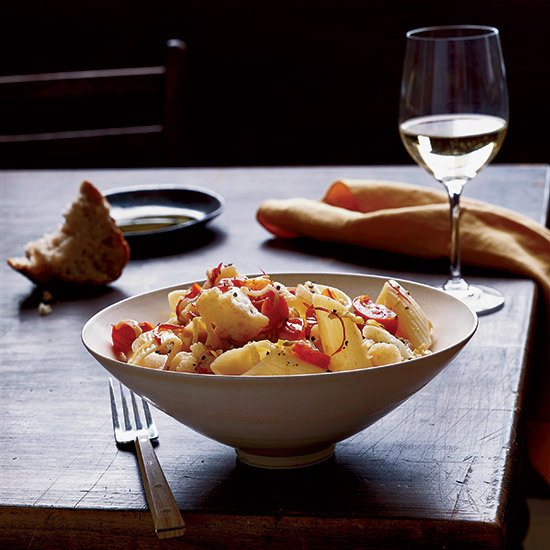 In winter and spring, Salvatore Denaro might make it with Umbria's small, violet-colored artichokes; in the fall he prefers cauliflower or broccoli. 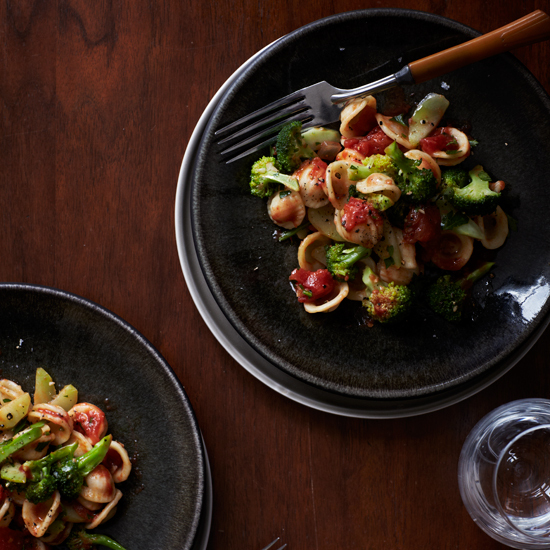 A pretty alternative is pasta con cavolfiore e broccoli siciliani, with equal parts cauliflower and broccoli; the dish is also terrific made with leeks alone. 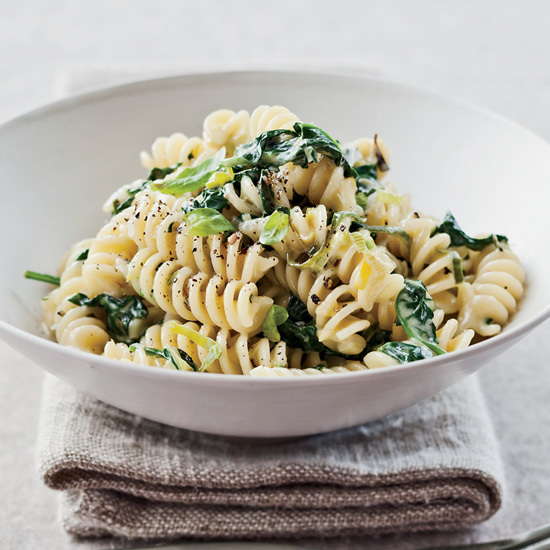 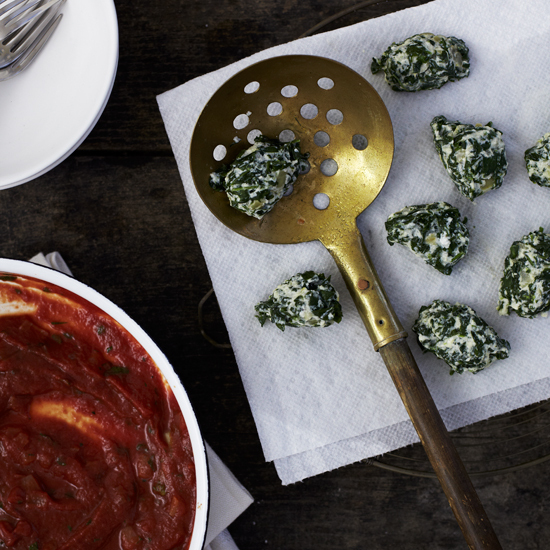 This super simple recipe takes a quick 35 minutes to whip up. 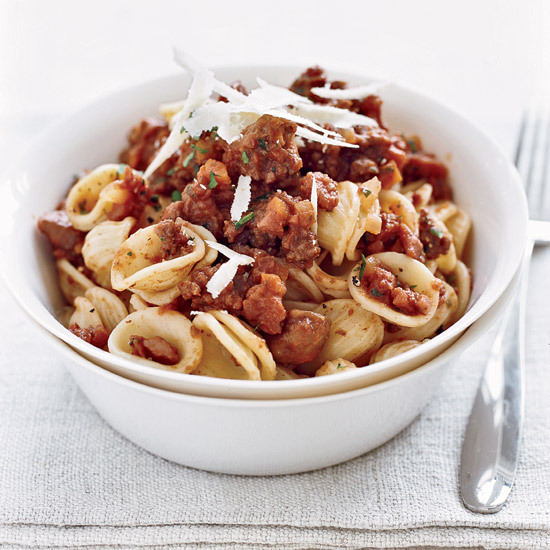 Store-bought dried orecchiette gets tossed with a bolognese sauce made with just ham and ground chuck. 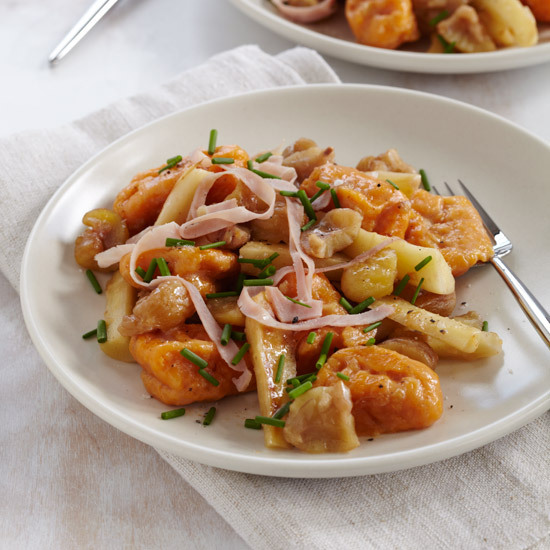 Finishing the dish with chestnuts (leaving out the porcini and squash) adds a delicious and unexpected touch. 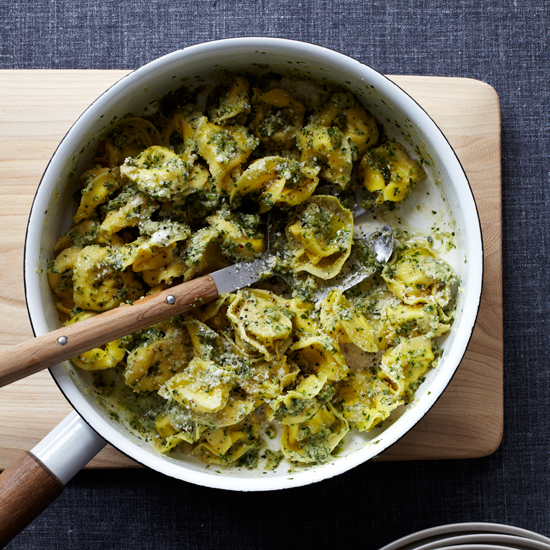 The pasta for this tortelli (a larger version of tortellini) is extremely silky and supple, which makes it excellent with the creamy ricotta-and-spinach filling. 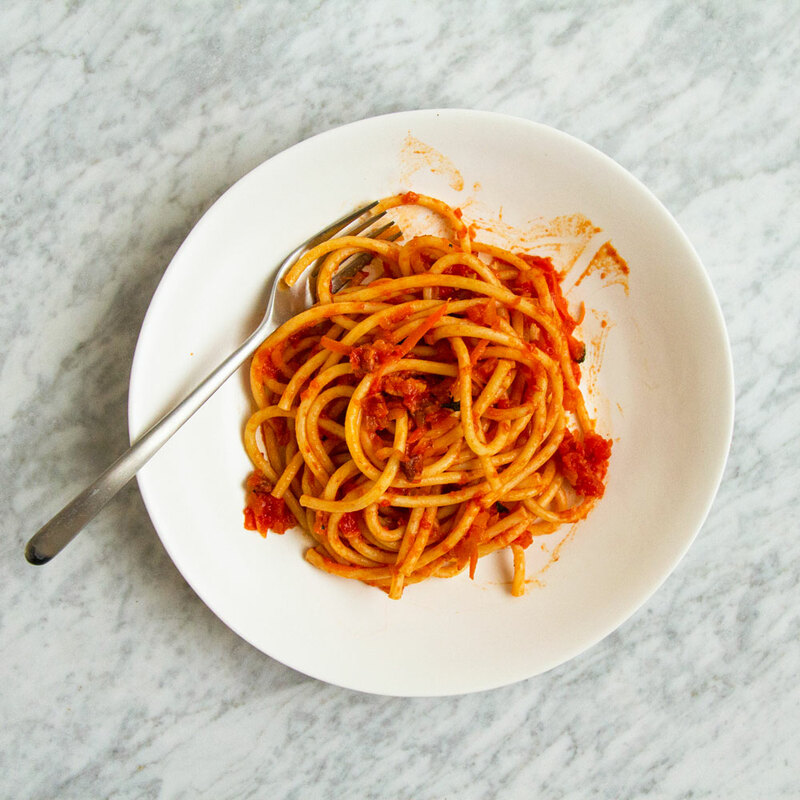 If there's any dough left over, cut it into noodles, as Marco Canora does, then dry it and store it in bags in the refrigerator to have on hand for last-minute dinners. 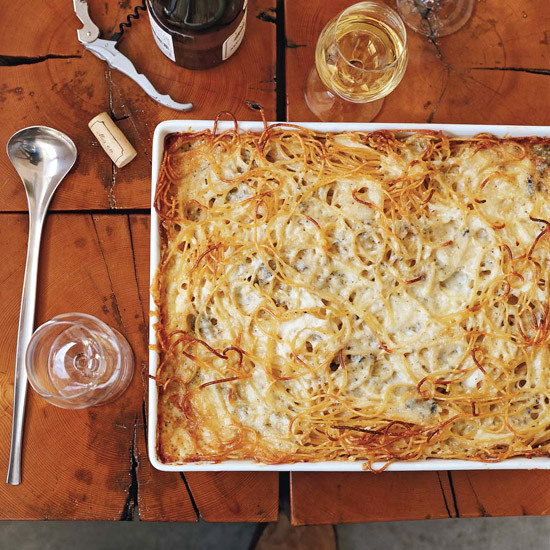 Marc Murphy grew up eating this intensely cheesy baked spaghetti. 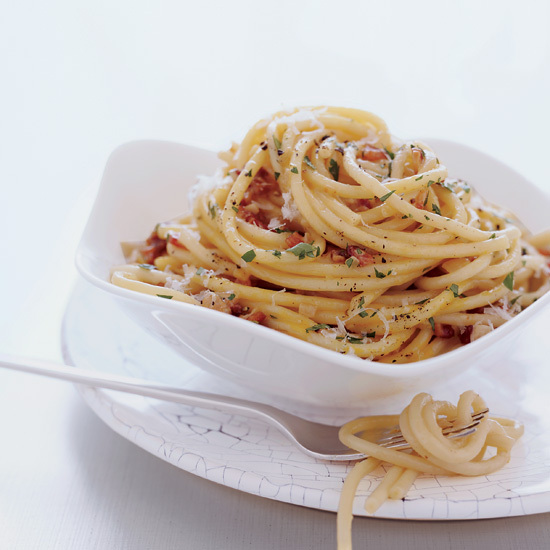 "When I was young, we lived in Genoa, where spaghetti is the pasta of choice. 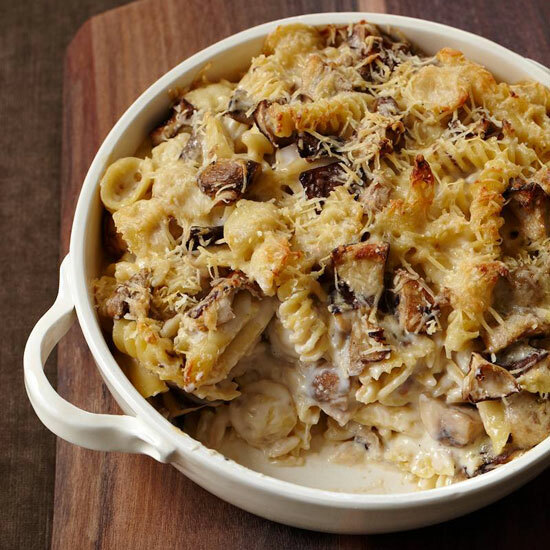 This is my mother's version of macaroni and cheese," he says. 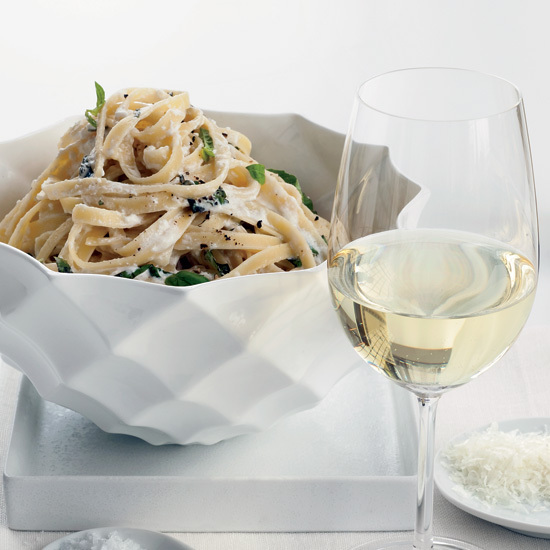 Jean-Georges Vongerichten transforms Gewürztraminer, a fruity white wine, into a light syrup. 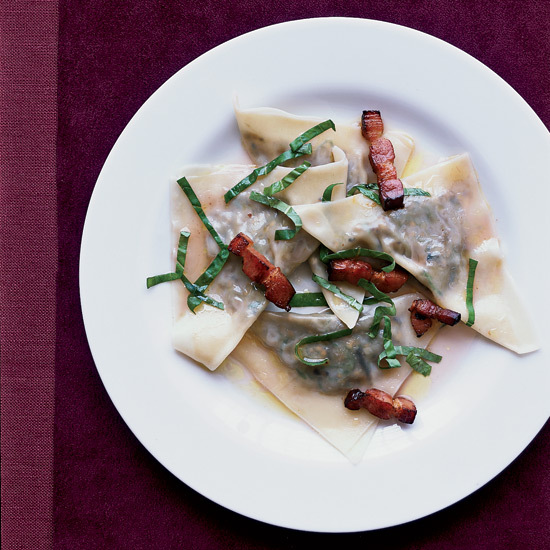 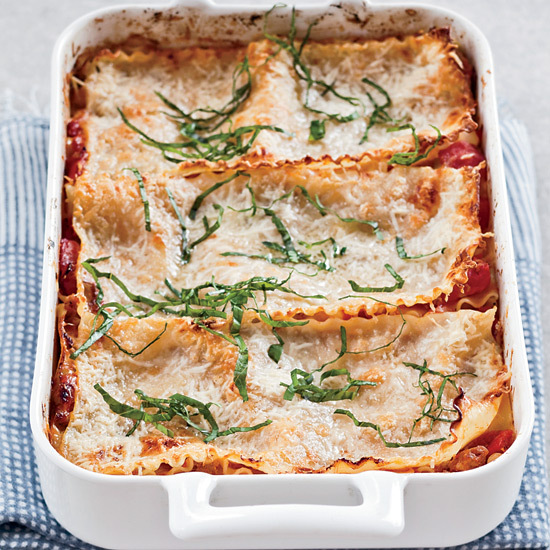 After swirling it with extra-virgin olive oil, basil and bacon, he drizzles the dressing over eggplant ravioli. 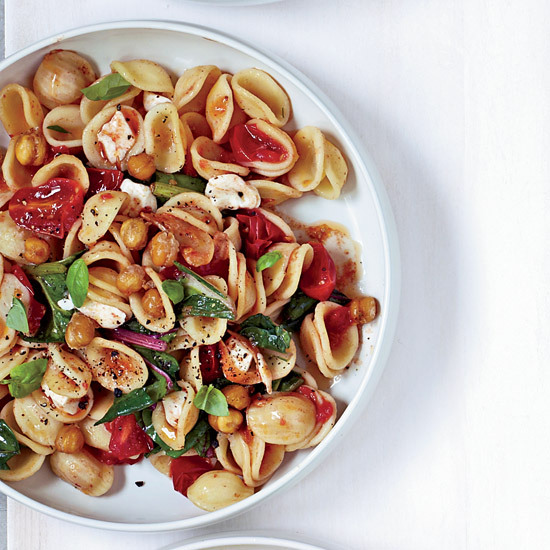 It would also be superb on a green salad. 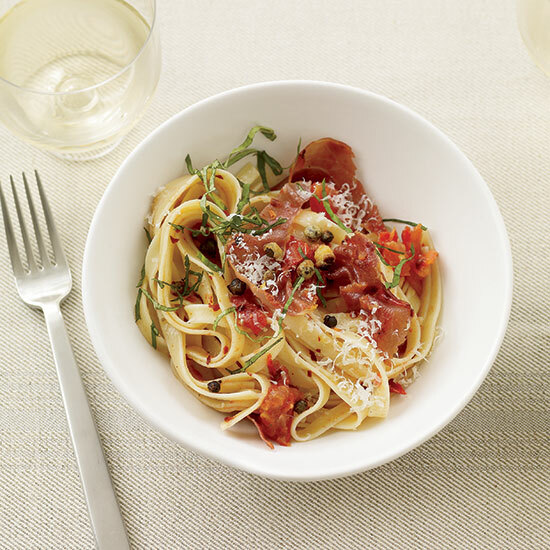 Try a fruit-forward Pinot Gris to pair with this dish. 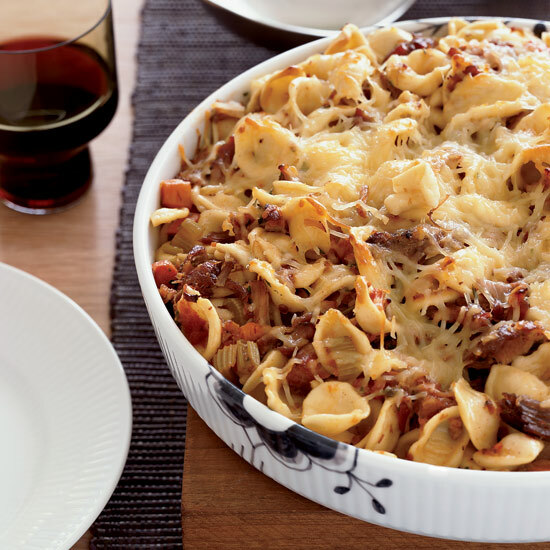 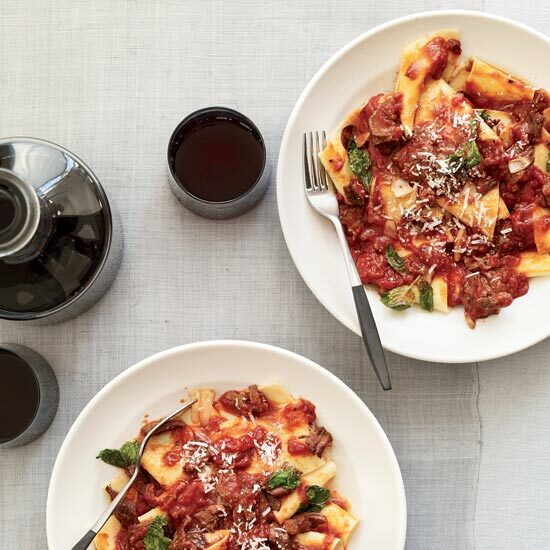 A hearty meat sauce, lots of melted cheese and pasta make this dish a crowd-pleaser. 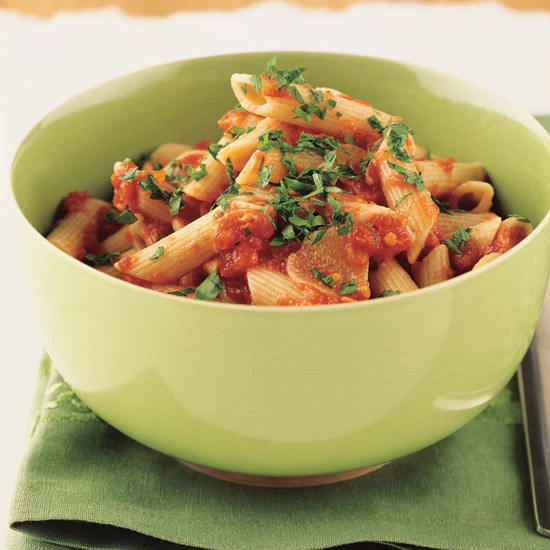 Mostaccioli, a smooth, tube-shaped pasta with angled ends, is the go-to here, but penne also works well. 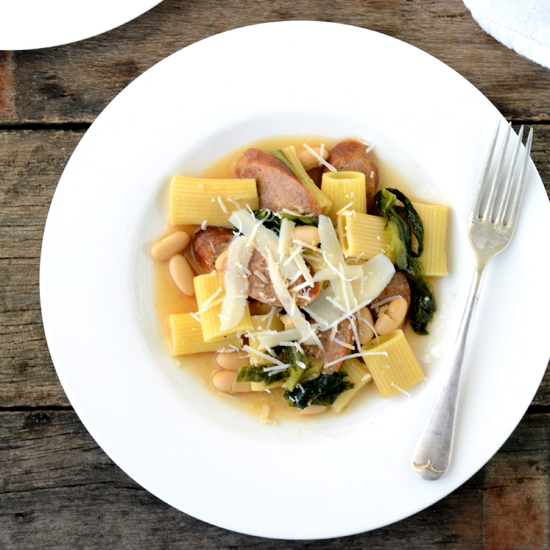 Sausage, escarole, and white beans join chunky rigatoni in a garlicky broth slightly thickened with Parmesan. 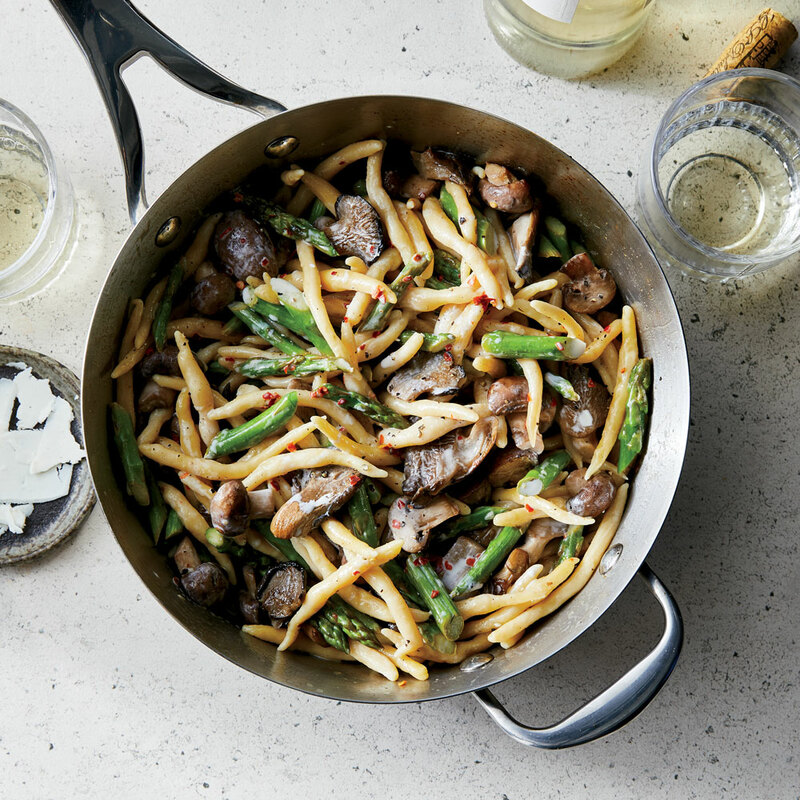 Don't stir too much after adding the beans, or they'll break up. 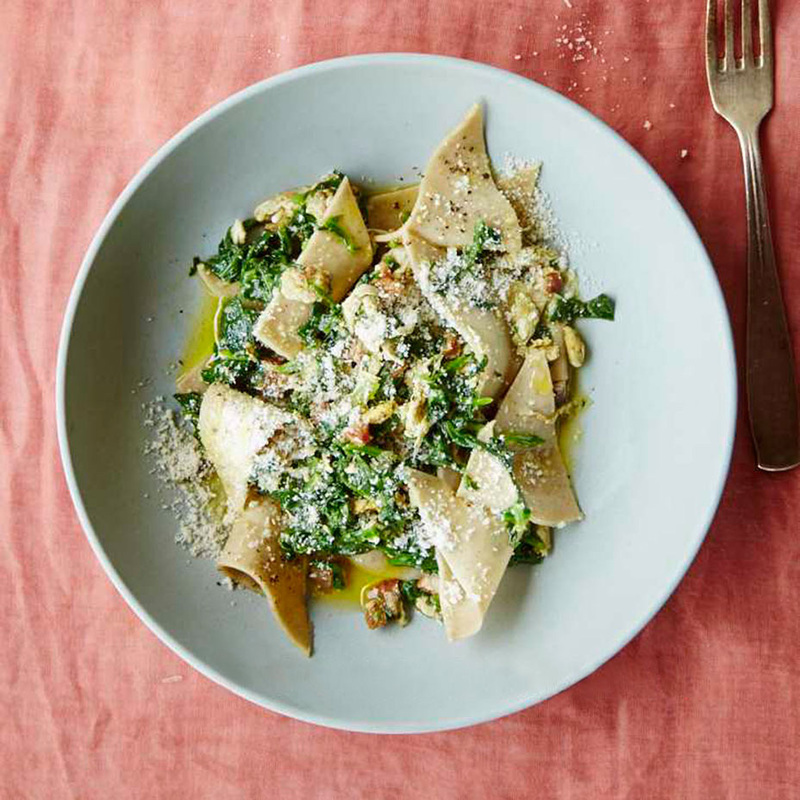 At Josephine Estelle in New Orleans, chefs Andy Ticer and Michael Hudman serve this sublime, buttery crab pasta with homemade tajarin, a ribbon-type noodle. 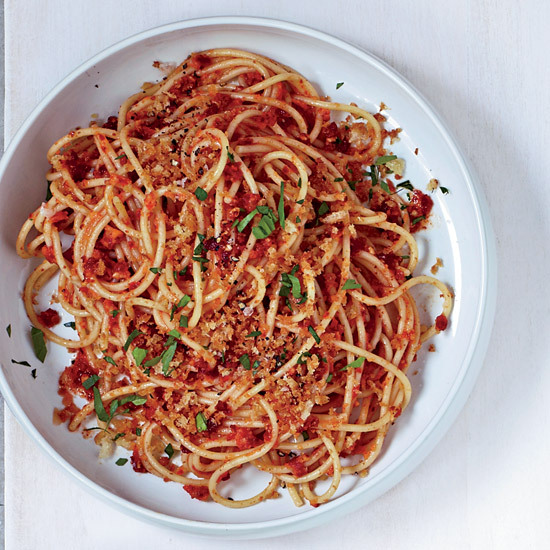 Thin spaghetti works nicely, too. 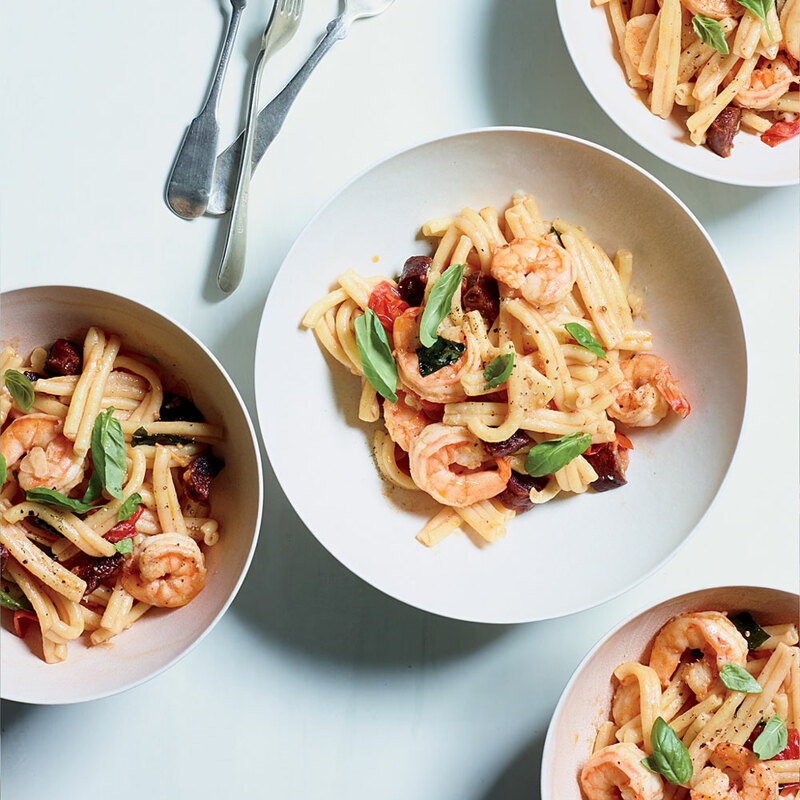 Food & Wine's Justin Chapple cooks chorizo in oil, then uses that oil to cook shrimp and garlic, infusing this entire dish with excellent smoky flavor. 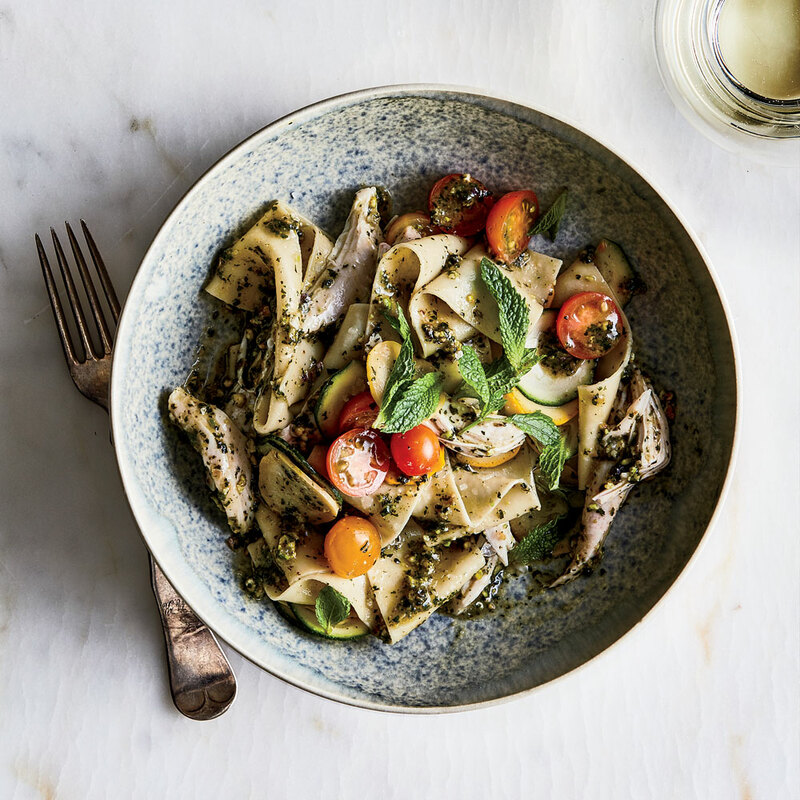 Food & Wine’s Justin Chapple makes a bright and nutty mint-and-pistachio pesto as the sauce for this fresh and summery warm pasta dish. 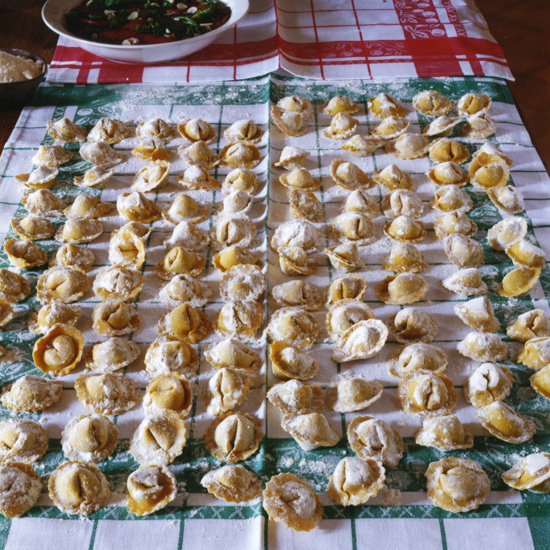 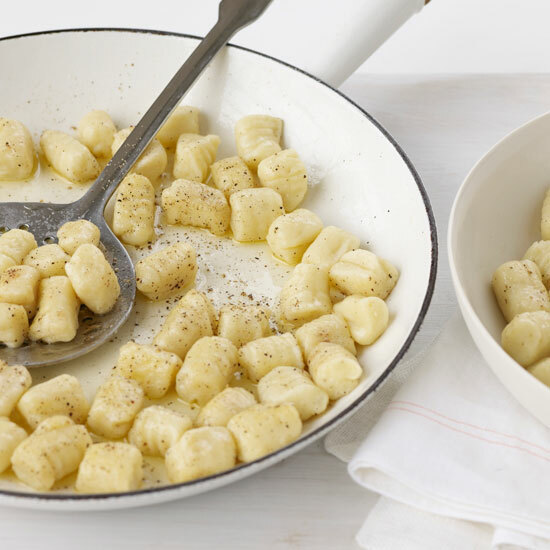 Allowing the pasta dough to rise (just like a bread dough) before rolling and shaping gives the cecamariti in this dish its characteristic texture and flavor. 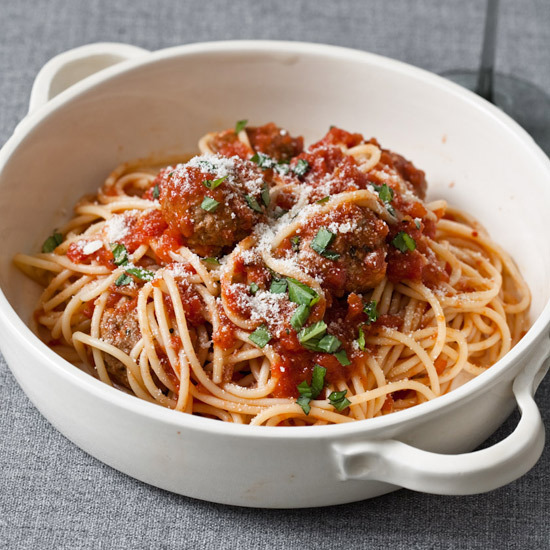 Fine Italian 00 flour can be found at specialty food shops and amazon.com.